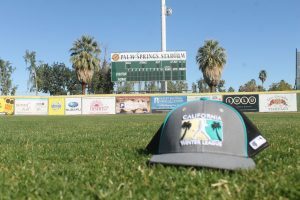 PALM SPRINGS, Calif. — Through 10 games in the California Winter League (CWL) season, over 35 of the 200-plus players have signed professional contracts. That number is guaranteed to increase as the season works its way toward the League’s championship on February 18. The players recognized below have stood out in more ways than one. The first man listed is Will Krug, who will embark on his second stint with the Windy City ThunderBolts of the Frontier League following the conclusion of the CWL. To this point, Krug is batting .387 in 31 at-bats and continues to play a sparkling centerfield for the Manitoba North Stars. He also boasts a whopping 13 stolen bases in 10 games, which is nine more than the next best player in that category. The University of Illinois product already has 86 professional plate appearances under his belt. Krug knows he can use that to his advantage in preparing for the ThunderBolts 96-game season. Krug is always looking to better his craft and understands how fortunate it is to be playing in a setting perfect to accommodate baseball. Another player who worked his way to the Frontier League thanks in large part to the CWL was Robert de Angelis. De Angelis impressed Florence Freedom manager Dennis Pelfrey early in the scouting process and ultimately earned the right to be considered a professional in 2018. De Angelis, a Division III product from Staten Island, New York is getting his first taste of the California sunshine. He is making sure to enjoy his experience while it lasts. In 24 at-bats, de Angelis has seven hits and all have gone for extra bases. The left-handed hitting outfielder has walked more than he has struck out and is batting .292 with six doubles and a home run for the Toronto Rush. Speaking of standouts who are exceeding at the plate, Gabe Gunter of the Alberta Grizzly is batting a healthy .421 with an impressive .988 OPS. 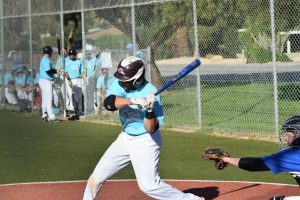 The 22-year-old watched his hard work pay off after manager Paul Noce offered the outfielder a contract to play for his Eastside Diamond Hoppers of the United Shore Professional Baseball League. Noce recognized the potential in Gunter’s 6-foot-2, 200lb frame. The Diamond Hoppers skipper wasted little time in nabbing the impressive left-handed hitter early in the California Winter League. Gunter is free to play out the rest of the CWL season knowing he is a pro, which takes away a heavy burden others still carry. At the same time, the native of Hawaii now holds himself to a higher standard. As it relates to the other phase of the game, CWL pitching coordinator and Windy City ThunderBolts manager Ron Biga mentioned that he is looking for three minimum qualities when it comes to pitchers competing to throw at the next level. They include: command, velocity and an ability to throw three pitches for strikes. Apparently, Chris DeRue checked those boxes because Biga offered the left-hander a contract to pitch for Windy City in 2018. DeRue will also have the benefit of pitching close to home, as the Lake Villa, Illinois native is right around the corner of Standard Bank Stadium. 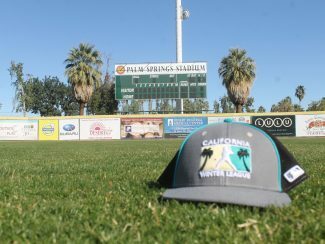 The Division III product can call his time at the California Winter League a success in several ways. DeRue has allowed only one run in three starts, manning a 0.53 ERA. The future ThunderBolt has struck out 20 while only walking two in 13 innings pitched. Last on the list is Mathew Dallas and he is certainly not least. According to a CWL scout, Dallas is considered, “among the top three arms” in the league. Manager of the Winnipeg Goldeyes, Tom Vaeth, offered Dallas a contract to pitch for his Can-Am organization in 2018. Dallas has plus velocity to accompany his hard breaking stuff. The 6-foot, 210lb right-hander had a cup of coffee with the River City Rascals of the Frontier League last season, as he completed 2.1 innings pitched in three appearances. 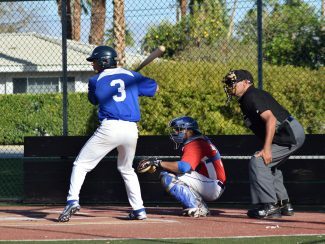 Dallas expects to add to that total in 2018 as he prepares to work in a very competitive independent baseball scene. About a week and a half remains in the California Winter League season and guys will look to find a professional home when it is all said and done. The CWL has kept the dream alive for over 600 players over its nine year existance as the list continues to grow. As for this list, the aforementioned parties have emerged from the pack and established themselves as professionals. For Krug, de Angelis, Gunter, DeRue and Dallas, the reality will be pro baseball in 2018.